That was quite a lengthy title, no? 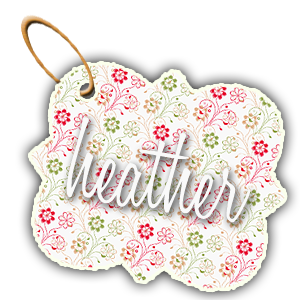 It seems fitting that my first legit post is the merging of my two lives: personal/crafty and work. After-all, those are the two most important (and time-consuming) parts of my life as of late. I met Maren about a month into working as a temp for our organization, well longer until I met her in person. She is located at a different site, so I talk to her frequently, but I don’t get to see her in person except in spurts when she can fly up here. During a lunch conference call (Yes, we do those) I found out Maren was getting married and planning a fabulous wedding! 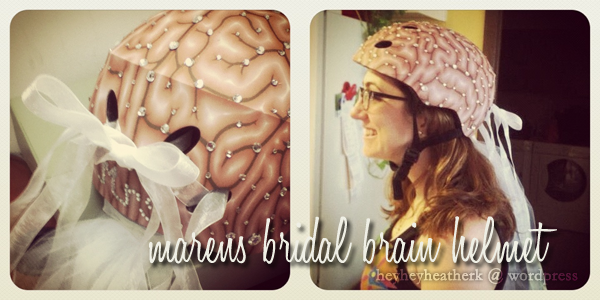 It was then we all began to figure out what we were going to do for her pending nuptials… Another one of our co-workers thought it would be fun to decorate one of our sports helmets, appropriately covered with a brain skin and give it to her. Unfortunately, we were not able to see her before she was to get married in late April, SO, we decided to send it off to her. I admit, I had to lie to her so I could get her new address, but it was the only way without giving away the surprise! 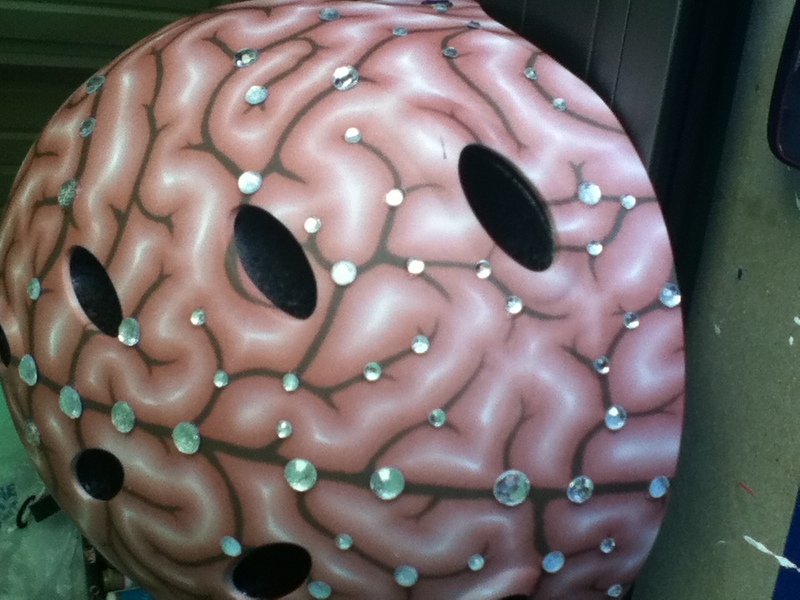 The helmet in the beginning stages of bedazzlement. Rules… of COURSE there are rules. 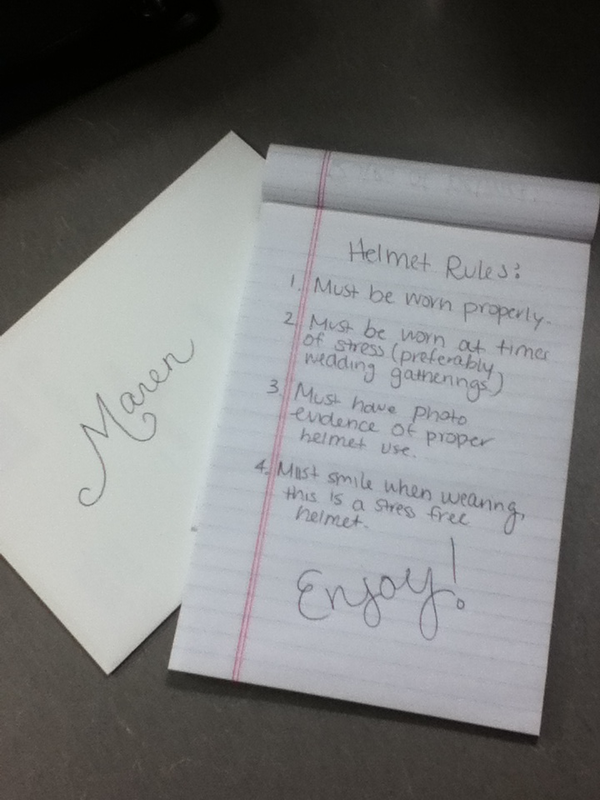 It would not be proper to give a helmet without explaining proper helmet use. I’m going to try to convince Maren to let me post pictures of her wearing it in her dress… *nudge nudge* 😉 They’re pretty precious, I must say.